These days when it comes to writing a document most of us go straight to our computer. In the area of literacy support there are many advantages to using a computer for text production: spelling and grammar support, word prediction, speech recognition etc. However in this post I want to look at the disadvantage. Thanks to the web, the computer gives us access to limitless information resources while at the same time it is also the source of limitless distractions. Although this is a problem faced by everybody (or at least the weak willed among us) reducing the availability of distractions can be beneficial to some people with literacy difficulties who find text production more arduous. Below are a couple of products that attempt to offer the advantages of physical keyboard input, word processing and web connectivity without the potential for distraction that usually accompanies the latter. Both could be loosely called Smart Typewriters and also offer advantages over modern laptops or tablets in areas like battery life and durability. If buying an new device is not practical or perhaps a bit over the top, at the end of the post I’ll look at some browser plugins and apps that aim to achieve the same result without the need of abandoning you primary computing device. The AlphaSmart Neo 2 (pictured above) is the most recent in a line of smart typewriters that were favoured both in classrooms and by professional writers and journalists for many years. It offers accessibility features like Sticky Keys and Slow Keys, Spellchecker, Typing Tutor and they claim it can sync with Google Docs (I wasn’t aware of this until now and can’t confirm it). This device was last updated in 2010 and discontinued by the manufacturer in 2013 yet I suggest it is far from obsolete. They are available on Ebay for about €25, even less if bought in bulk. It will last up to a year on 3 AA batteries and is tough enough to take quite a bit of punishment. 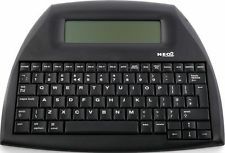 It was coming across this new product, the FreeWrite that actually got me thinking about the AlphaSmart Neo above. FreeWrite (pictured above) is a similar product except offering a (much) better keyboard, better screen and more current online syncing capabilities (Google Drive, Evernote, Dropbox currently). Details are a little sketchy on whether the FreeWrite offers keyboard accessibility features like Sticky Keys or Slow Keys or even word processing capabilities like a Spellchecker or thesaurus. However one advantage concerning accessibility it has over the AlphaSmart is that it does offer the ability to adjust the font size and a larger screen to accommodate this. The FreeWrite isn’t cheap (available for pre-order at over €550) but it looks like a quality product (the Cherry mechanical keyboard would be a joy to use and the e-ink screen will offer your eyes a much needed break from the glaring display as well as being usable in direct sunlight). I’ll update this when (or if) they come back to me about the accessibility features, without which I fear this product will remain an object of desire for hipsters and professional writers and of no practical use to many of us. Update: FreeWrite got back to me with the following reply. “there are no plans for a spellchecker or other accessibility features but that doesn’t mean they won’t be added by us or someone else in the future. The Freewrite is a platform that we are opening up to developers so we expect that it will be extended and modified. We’d love to support you and the needs of a lot more people!”. I find this both disappointing and exciting at the same time. It’s a completely understandable approach for a new company launching a niche product. Do you put resources into implementing accessibility features? or do you put them into creating the best platform possible and leave it open for other developers to adapt and build functionality. It’s like iOS v Android. Keep an eye on FreeWrite. If leaving the computer isn’t an option or your preference, techniques like time-boxing (Pomodoro) can help you to keep focused. As can removing visual distractions, creating consistent background noise or if all else fails removing temptation by actually blocking sites. Below are some apps and plugins that might be useful in this area. Strict Workflow – 25min/5min workflow (Pomodoro): 25 minutes of distraction-free work, 5 minutes of break. Background sounds and white noise – does what it says.. This entry was posted in Education, Employment, Literacy, universal design and tagged literacy support, Universal Design by Karl O'Keeffe. Bookmark the permalink.